We are concerned that the “Stop Secret Surveillance Ordinance” currently being considered by the Board of Supervisors will limit the ability of law enforcement to fight crime with video cameras. This law is well-intended. It is important to acknowledge the problems with facial recognition technology and the city needs a policy for use of traditional video cameras. We support the intention of this law and offer the following amendments to ensure its success. San Francisco residents concerned about crime and safety should contact their district supervisor at City Hall and urge them to re-think a proposed law that could severely restrict the ability to stop crime with video surveillance. Read more for background info on the law, a suggested message to supervisors and a list of every supervisor’s email address. Shirin Oloumi, a prosecutor for the San Francisco District Attorney's office known as the "Queen of Car Burglaries." Photo by Yalonda M. James. To scores of city residents, Shirin Oloumi is known reverentially as the Queen of Car Break-ins. No, it’s not because she smashes car windows and swipes backpacks with abandon. It’s because she prosecutes the guys who do. Fighting Big Brother and Big Tech might feel good when privacy is a concern. But a proposed law to ban facial recognition and severely impede San Francisco’s use of security cameras is full of unintended consequences that won’t keep us safe or free. Stop Crime SF guest OpEd published in the San Francisco Chronicle. Surveillance video shows a bride and groom standing next to their burglarized rental car on Jan. 28, 2019 near the tiled steps at 16th Avenue and Moraga Street. The newlyweds were visiting San Francisco from Asia. Newlyweds and tourists from Asia had their car broken into and luggage stolen as they posed for photos on the mosaic steps near 16th Avenue and Moraga Street in the Sunset District. The theft was just one of roughly 60 auto break-ins that happen every day in San Francisco. Stop Crime SF board member Libby Dodd speaks at a press conference featuring State Senator Scott Wiener, District Attorney George Gascon, Supervisor Vallie Brown and San Francisco Police Chief William Scott. Stop Crime SF is backing a proposed state law by Senator Scott Wiener to close a legal loophole that makes it difficult to prosecute car break-ins. San Francisco is experiencing a car break-in epidemic and this common sense change in the law will give prosecutors the tool they need to put criminals out of business. Defendant Deshawn Patton and Judge Christopher Hite. 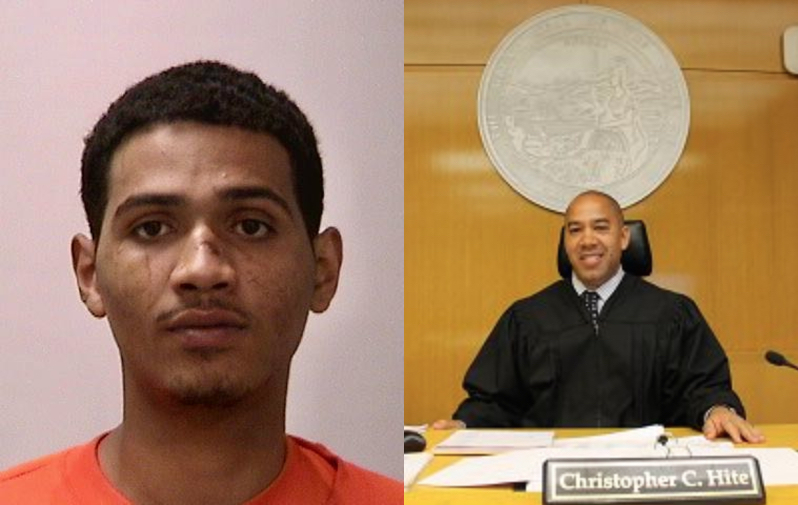 Stop Crime SF and our Court Watch program was featured in the San Francisco Chronicle when one of San Francisco’s most prolific car burglars was finally sentenced to state prison in a case we followed. Our advocacy had an impact. Before Stop Crime SF got involved and before the media started paying attention to this case, the judge was planning to let the defendant off on probation (even after he had been arrested for new crimes while already on probation). The latest FBI crime statistics show San Francisco ranks #1 in property crime in the nation. Stop Crime SF has a Court Watch program to ensure that judges take crime seriously in San Francisco. Thanks to the San Francisco Chronicle for covering this case and mentioning the work of Stop Crime SF. Smashed glass on curbs and sidewalks is the new normal in San Francisco with tens of thousands of car break-ins reported annually. Our criminal justice system needs the right incentives for offenders to change their behavior. Lawbreakers need to know they will be held accountable if they violate the terms of probation. And judges need to know citizens are watching. Read our full OpEd published in the San Francisco Chronicle. 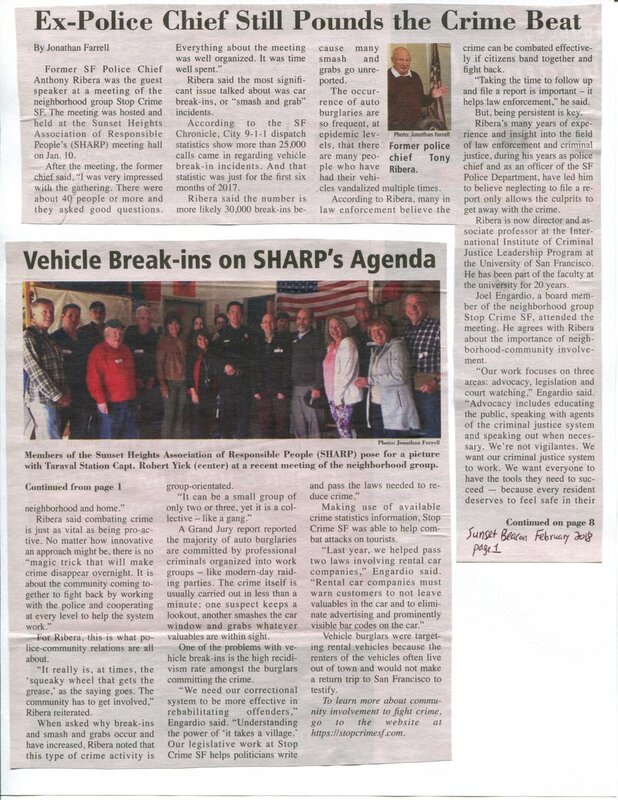 Stop Crime SF and our Court Watch program was featured in the San Francisco Chronicle. Columnist Heather Knight highlighted the egregious case of a repeat offender and lenient judge we had long been following. 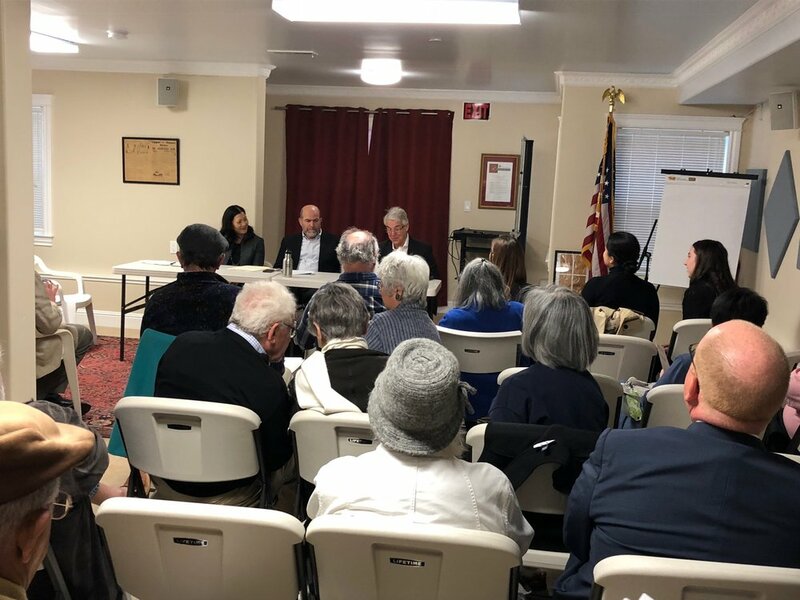 District Attorney George Gascon and Stop Crime SF board member Nancy Tung discuss the impact of Prop 47 and San Francisco's property crime problem before a full house in the SHARP community room. Four incumbent judges (top row) are being challenged in the June 5 election by four criminal defense attorneys (bottom row). So you think crime is bad now? San Francisco’s epidemic of car break-ins and home burglaries could get worse after the June 5 election — if voters approve a judicial coup attempt by four criminal defense attorneys. They want to “change our justice system from the inside out,” and not for the better if you are a potential victim. San Francisco's courts are already too soft. Retain the incumbent judges if you don't want to see even more property crimes. Stop Crime SF supports Proposition H on the June 2018 ballot. This practical Taser policy takes the politics out of neighborhood safety. Our community meeting led the local TV news on ABC. The epidemic of car break-ins was the topic and state assemblymember Phil Ting spoke about legislative solutions. Stop Crime SF is a group of San Franciscans working together to reduce and prevent crime in our neighborhoods while holding public officials and the criminal justice system accountable. Sunset Beacon coverage of Stop Crime SF community meeting with former San Francisco police chief Tony Ribera. February 2018.